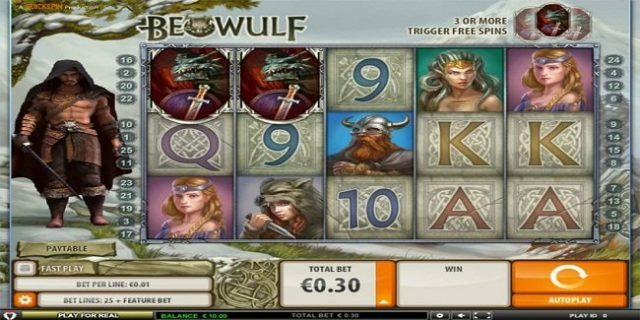 Beowulf Slot is 5 reels 25 paylines video slot game powered by Quickspin software platform. The game is inspired by Old English epic poem with the same name. The game and reels are framed in iron bars with Beowulf standing both of the side i.e. left and right. The reels of the game are being set against the backdrop of snow and mountain. 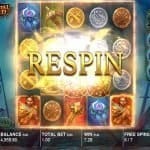 You can play Beowulf Slot at any of these Quickspin Casinos. Minimum coins per line for the game is 1, while maximum coins per line is 10. Players can choose coins sizes which range from 0.3 to 300, whereas the game offers a jackpot of 500 times of players total bet. 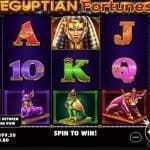 Three basic options in the game include Total Bet, “Spin”, and “Auto Play”. “Total bet” is used to Change the coins size, ‘Spin” is used to play the game and ‘Auto Play’ option is used to turn the reels on without interruption for a certain amount of times. Horn is the wild symbol in this game and it can be substitute for all other symbols except free spins scatter, sword symbol and the dragon Bonus symbol. If a player land 3 or more Dragon symbols on any active reels, he would trigger free spin feature. 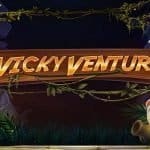 One can get 10 or 20 or up to 30 free spins in this game. The Sword symbol is another wild symbol in Dragon Fight feature and it will remain locked in place until it is removed by Dragon or any other feature ends.